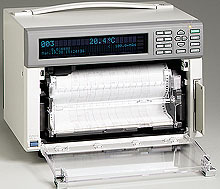 Nota: Each recorder comes with one (20 m) Z-fold chart, one 10-colour ribbon and complete operator's manual. All units may have display with °F/°C and 50 Hz option field selectable. Only one communications option per unit. Other options can be combined as required. Floppy drive units include free conversion software.